Salisbury, MD: 3rd Friday is pleased to announce its line-up for the 2019 outdoor season. Downtown Salisbury’s monthly art and entertainment event uses themes in the months of April through November to keep things exciting and to spur creativity and fun. Some themes are fan favorites and occur every year; while other themes come and go. This year 3rd Friday is adding a new theme – Moon Walk – to commemorate the 50th anniversary of the moon landing in July. A few fan favorites got makeovers this year, with “Dog Month” becoming “Animal Kingdom” and “Comic Con” becoming “Super Heroes”. No matter what theme, every 3rd Friday will be tons of fun this season. 3rd Friday kicks off the 2019 outdoor season on April 19th with “Hello Spring” –with everything from baby animals and spring flowers, to sustainability projects and local environmental groups. May 18th will have a “Wheels” theme- coinciding with National Bike Month, a Pinewood Derby, and the annual Salisbury Skate Park fundraiser and ramp zone. This June, 3rd Friday is mixing up the themes with fan favorite “Dog Month” getting a name makeover to “Animal Kingdom” – highlighting not just canines, but all of our beloved pets and animal friends. July 3rd Friday’s theme “Moon Walk” will commemorate the 50th anniversary of the lunar landing, with space themed fun and of course, moon walk demos. August 16th’s theme will be “Water World” to keep things cool, complete with a Rubber Ducky Race in the river. September 20th, check out “Chalk It Up” for a night of public art and expression. Oct 18th theme is “Super Heroes” with a comic con feel, free comics, highlights on local heroes, and a costume contest for kids and adults. The outdoor season will wrap up on November 15th with a “Holiday Lights” theme that will include the annual Holiday Tree Lighting Ceremony on Government Office Building lawn, as well as, a last chance to shop from the 3rd Friday vendors for everyone on your list. This year 3rd Friday footprint will vary based on whatever construction projects are ongoing at the time. April will open with a classic 3rd Friday layout, and will expand to the W. Market Street / Parking Lot 15 area, as construction nears the N. Division corridor. The latest information on road closures, and parking will be posted online. 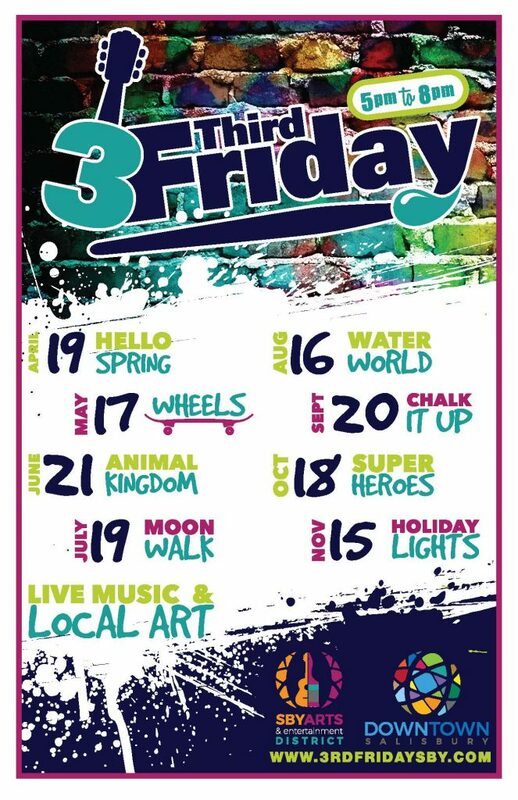 3rd Friday is a free once-monthly art & entertainment festival in Downtown Salisbury. For more information visit www.3rdFridaySby.com. To be a vendor at 3rd Friday you must be an artist, crafter or non-profit organization, and you must register by emailing a description of what you hope to set-up to 3rdFridaySby@gmail.com 3rd Friday is a downtown economic development initiative and a project of the Salisbury Arts & Entertainment District in partnership with The City of Salisbury.